This epic story begins with a story. As a post-graduate student with an MFA in Creative Writing, Michael Paterniti—like many or most MFA’s in Creative Writing—was finding it nearly impossible to land a job. He ended up editing a legendary college town delicatessen’s newsletter, wherein the equally legendary deli owner recounted his adventures scouring the planet for awesome new foods to sell. One story Paterniti edited concerned “the world’s greatest cheese,” handcrafted in a small Spanish village called Guzman. Something about this story struck a chord in the young graduate. Here’s this cheese made by a village farmer, and it’s selling for usurious amounts at Harrods? The story of the world’s greatest cheese stuck with him. Pass a few years, and Michael found himself married with two small children. Paterniti and his wife, Sara, by now have their own careers as globetrotting journalists, plus the two kids, and yet the cheese was still there. One night, on a lark, he and a Spanish teacher friend called the only number they could find in Guzman—the local tavern—and they asked about the guy who made the cheese. And that phone call launched Michael Paterniti and his family into a story with so many textures and layers, it’s difficult to believe. In Guzman, a “telling room” is another name for what they call bodegas. Here in the U.S., “bodegas” are a type of convenience store, but in Guzman, it’s a family’s personal cave, hewn over the millennia into the limestone hillside. Families and friends gather in these caves—which are dry and cool, and typically well furnished. They drink wine, eat, and tell stories, some of relatives past, others romanticizing the Spain of yore. The telling rooms are as much a part of Guzman’s social life as the tavern or Cathedral. Soon, Paterniti and his wife are both off to Madrid covering stories for their jobs, but he manages a little side-trip to a tiny village that once made the world’s best cheese. The cheese-maker is named Ambrosio, a larger than life man with a booming voice, a deep-seated love of the land, and the rare talents of a natural storyteller. Michael is entranced, both by Guzman and its gentle bard, Ambrosio. Over the years, he visits Guzman on numerous occasions, even once spending six months there with his wife and children. The cheese’s story is not as idyllic and joyous as you’d imagine. We learn how Ambrosio and his family painstakingly recreated a lost family recipe, experimenting batch-by-batch, until they got it right. Their friends loved the cheese, and soon they decided to produce it on a larger scale, market it to the world, and make a little money off of it. The cheese was spectacular; the cheese business turned out badly, with lawyers and bankruptcies and shattered friendships. Michael kept working on his book. He threw away every draft he wrote. He’s a journalist—a professional writer, for crying out loud—but he just couldn’t capture what he needed in his words. “The Telling Room” tells two inextricably intertwined stories. First, there’s the legendary Ambrosio, whom Paterniti elevated to legendary status during their early meetings. The second story is about Michael, the journalist who knows he has a great story, but can’t write it. Michael realizes that his story is somehow incomplete. He makes another trip to Guzman, and asks some hard questions about what really happened. These lead to even harder questions, as the big-city American journalist struggles to find the real story of this amazing cheese. In a perfect world—or a perfect work of fiction—everything would have ended up shiny and happy. This being a true story…well,nearly everything ends well. “The Telling Room” spins a wonderful tale worthy of Ambrosio himself relating over gallons of homemade red wine. 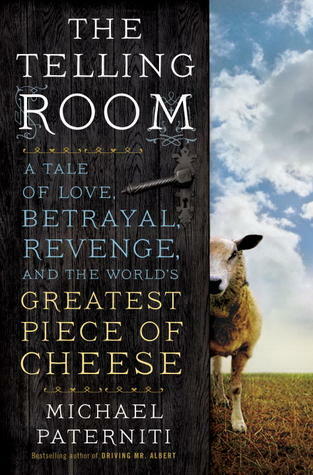 From first learning of the world’s greatest cheese in that deli newsletter, to publishing “The Telling Room” in 2013 has taken over twenty years. Michael Paterniti went from being a broke, prospect-lacking post-graduate to being married, with three kids and a successful writing career. Like Ambrosio’s cheese, this story needed to be crafted with love and attention, and aged properly so that all the flavors come together perfectly. How a farmer from an 80-person village and a globetrotting American journalist had their lives intersect so profoundly takes a careful mixture of skill and heart to write. This book achieves it. Oh, and the cheese? It. Was. Spectacular.